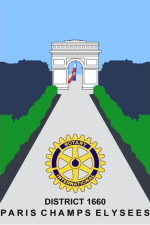 The Rotary Club Paris-Champs-Elysées is happy to welcome our Rotary friends from all over the world to our weekly statutory meetings. Our meetings are held every Tuesday morning from 8am to 9am (except every third Tuesday of the month) at the Fouquet's restaurant, on the Champs -Elysées Avenue, in the heart of Paris (more precisely, 99 avenue des Champs-Elysées, 75008 Paris). As a member of the broad Rotary family, joining one of our meetings when you are visiting Paris is a great opportunity for all of us to learn from each other, exchange ideas and share passion. English is obviously spoken and understood, but you should expect part of the discussion to sometimes happen in French as well. So, if you have often wanted to practice the French you learnt during your school days, in a friendly and forgiving environment ... now is the time ! If you are interested and wish to join, please do contact us, preferably a couple of days in advance for planning purpose. For convenience, you may use the contact form of this site. We do look forward to welcome you soon, "sur les Champs Elysées" !